The Dave Graham problem Mithril 8b at Cresciano from Moon Climbing. Periodically I reread the classic fantasy trilogy by JRR Tolkien, The Lord of the Rings. 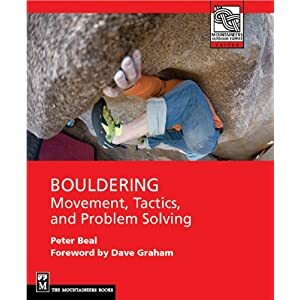 For some reason, this year I was really struck by the impact this book has had on climbing. Granted that climbers can be a nerdy bunch, but a search of route names in the US and abroad shows a prevalence of borrowing that no other work of literature can compare to. In the quite literally Misty Mountains of New Hampshire, route after route was directly named after places in the book with examples like the Mordor Wall, Mines of Moria or the less appealing Orc, a nasty 5.8. Here in Colorado, boulder problems such as Gandalf indicate the enduring appeal of the books. In Switzerland, a place that had a great affect on Tolkien's vision of Middle Earth, Dave Graham problems such as Shadowfax and Mithril seem to reflect the atmosphere of Rivendell. As it happens the Swiss valley of Lauterbrunnen was the model for this mythic valley, based on Tolkien's visit there as a young man. The list goes on and on. 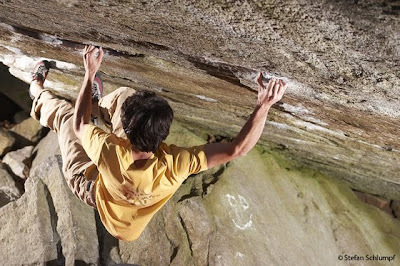 Paul Robinson on Shadowfax 8B at Chironico, photo from 27 Crags. What is the appeal of Tolkien's writing for climbers? I think there are a number of possibilities. First the books are ultimately about a long expedition to climb a mountain to find, what else but The Cracks of Doom, later immortalized in climbing history as the first 5.10 in Yosemite Valley. The terrain that the characters traverse in the book is very well-known to climbers including mountain passes, craggy valleys, deep forests and so on. There is also the whole idea of the quest that appears on the face of it ridiculous. Many critics have found fault with the idea of the Ring as an object of desire because it seems too small and innocuous to have such power associated with it. What could be more similar to a boulder problem?. Finally there is the idea of creating a fantasy world out of the raw material of nature. 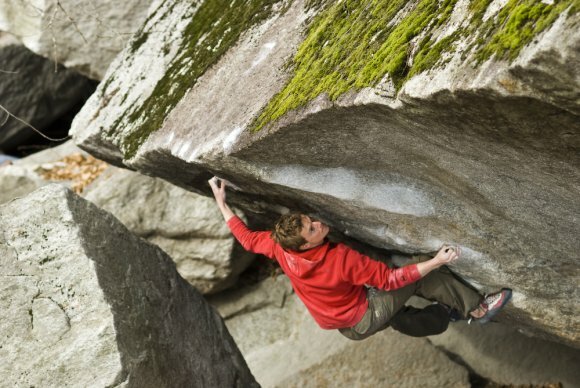 Climbing is at its essence an act of imagination, imposing order and meaning on the chaos of the natural environment. Tolkien's genius created entire languages and geographies that mirror in interesting ways the naming practices and customs associated with climbing. Little wonder then that many climbers over the decades following the publication of LOTR have honored this connection. I think there are many other parallels and connections that have made the climbing world find particular resonance with Tolkien's creation. Somehow, I feel confident that the associations made so long ago with these books will persist well into the future. Mythological names have always been popular. How many routes named Icarus/Ikaros are there? Thousands? Tolkien's novels are some of the most read novels in the world making his 'middle earth' the most well known mythology. More climbers know of Shadowfax than Skinfaxi. It's definitely interesting how many route names reference works of literature or music... though I guess if you out in the middle of nowhere and your not climbing those are two great ways to pass time.